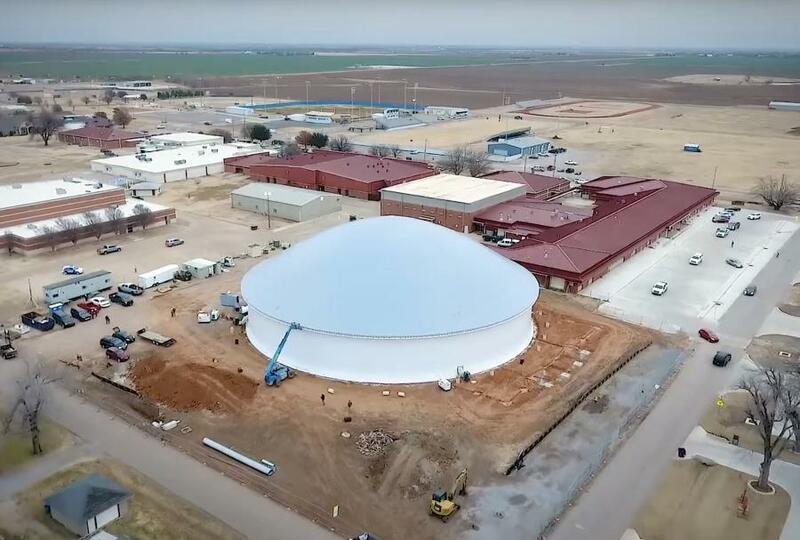 To help keep Oklahomans safe, Hennessey Public Schools and South Industries have teamed up to construct a multipurpose school gymnasium and storm shelter in Hennessey, Okla. The choice to use a monolithic dome design was an easy one due to the inherent advantages of the dome shape. These FEMA-certified buildings are rated to withstand winds in excess of 245 mph allowing survival and safety during the most intense tornadoes. The superior wind resistance, lower construction and maintenance costs are key reasons why Mike Woods, superintendent of Hennessey Public Schools chose the dome shape and South Industries. Another key benefit of the monolithic dome is the flexibility of interior space. As the needs of the district evolve the interior floor plan can easily and cheaply be changed to meet the needs of the district. The gymnasium is being constructed on the current Hennessey High School site. This multiuse dome will be used as the high school gymnasium and when needed as a community storm shelter. Randy South, an owner at South Industries, said, "Domes are very energy efficient, and very strong. They'll take a direct hit from an EF5 tornado. They make a great school because it protects the kids. These buildings are elegant and especially for the price a school district will pay. The school administrators will find the costs to heat and cool these dome buildings is far less than what they would have to pay if they were using conventional structures. The school board and superintendent had great vision when they designed this building and presented it to the public because it saved the community a tremendous amount of money." The Hennessey multipurpose facility began construction on Nov. 6 and should be completed prior to the start of the coming school year. 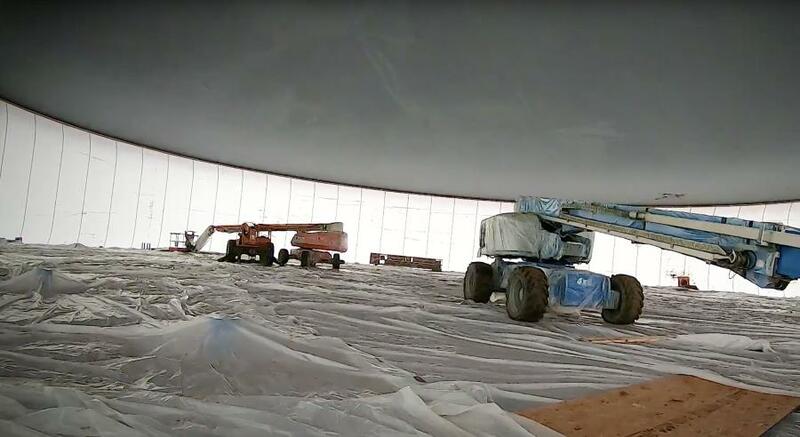 Inflation of the dome was a site to see — the huge, soft form is blown up much like a balloon. It was inflated in two hours and the campus had the beginnings of a new building. Of course, much more work will go into the building to transform it from a soft, billowy dome to a hard, concrete shell that can withstand tornadoes. After inflation, the inside of the Airform was sprayed with a polyurethane foam creating an insulated and hardened dome shape. Once the foam is set, rebar is placed creating a strong metal framework for shotcrete to be applied. As the dome walls are smoothed and many layers of the shotcrete applied, the dome shell is completed. 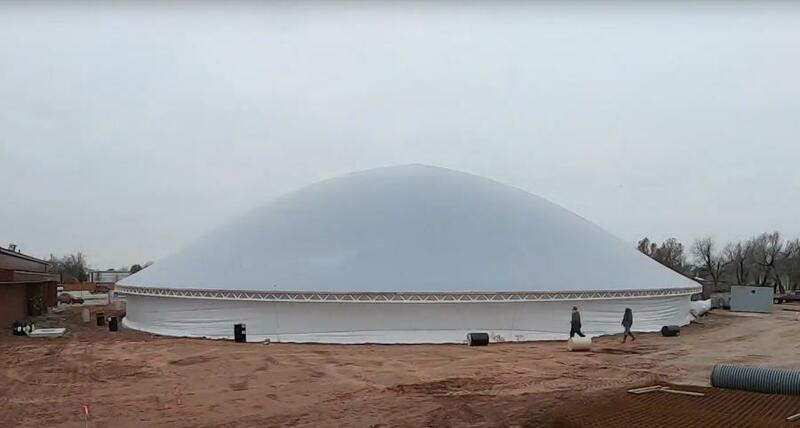 The general contractor of the project is Wynn Construction Co.; the architect of record is Michael McCoy; and South Industries is building the dome. Upon completion of the dome, the public will be invited to tour the amazing new gymnasium and community safe shelter. South Industries is a design and build contractor of monolithic domes. Descending from the inventors of the monolithic dome, South Industries has built domes across the world and in nearly every state. Through continuous innovation, South Industries has constructed structures that satisfy, amaze and move the industry forward. For more information, visit southindustries.com.